Djedi was an ancient Egyptian soothsayer and magician famed for being able to make the dead come back to life. Quite a name for a perfume, but then again, Djedi isn't just any perfume. Like Chanel No. 19, it creates a disquieting atmosphere as soon as you put it on. The balsamy spiciness of vetiver is attended by a hint of clove and vanilla (not in the official list of notes), after which the comforting rank of civet darts around in the back like the actual animal. The rest of the Djedi rests on a chypre leather base. With rose, vetiver, musk, oakmoss, leather, civet, and patchouli, Djedi has been described as "the driest perfume of all time," (Roja Dove), a "tremendous animalic vetiver" (Luca Turin), and an animalic chypre. The magic in Djedi is its ability to be both dramatic and quiet about it, like a secret pagan ritual going on under cover of darkness, with little fanfare. We don't see Djedi performing his magic rituals, but we note the curling smoke, the burning incense, the fragrant oils, the portent of something heavy and dark. We sense this as if we were intruders on an unseen and unseeable act of alchemy, something happening behind a curtain, just outside our purview. If Djedi were on a color wheel, there would be nothing bright, but everything rich and deep: chartreuse, saffron, sable brown, inky black. Adjectives I've read that describe Djedi: medicinal, smooth, earthy, oriental, mysterious. I think of the forest in Guillermo del Toro's film Pan's Labyrinth filled with creatures that are beautiful, terrifying and remote, in a fairy tale land we can only wonder about. 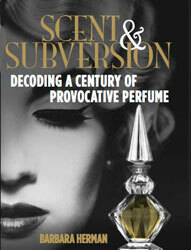 I loved this Basenotes reader's comment: "It seems to tap into the limbics more than most, and work on a deeper level where the true power of perfume lies." I like the idea that there are certain perfumes that get stuck in our craws a litte bit deeper than others, that leave an imprint and truly make an impression. Djedi is one of those perfumes.